Ebay item # 300038452890 This is from a Raleigh built Hercules. Chrome fender set for 26 inch EA3 wheel. I finally discovered why Sports chainguards so often have an outward dent in the middle. My leather shoe caught on it as I started and pulled it right out. I have a new, old stock Park Cotter Press that I am looking to trade for a correct Raleigh Pump (the black one) in very good + condition to complete my Raleigh Sports bike. I have pictures of the Park Tool (to serious trader) - the tool is beautiful & shiny & will cost me a lot to ship because of the weight. 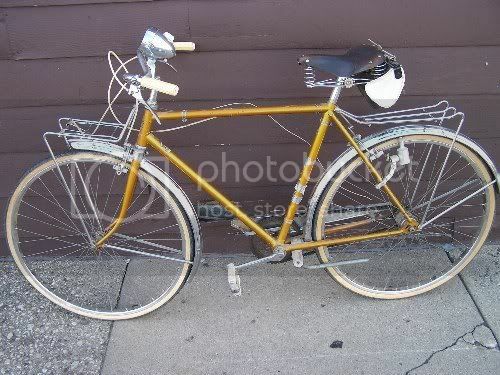 To be more specific, I'm seeking a mid to late 1950's Raleigh branded inflator. I just picked up a 1963 Men's Hercules 3 speed from my buddy to overhaul. The only decal is on the chain guard all others have been worn off. Also missing the headbadge. Would anyone have or know where to look (besides ebay, i've an active search going there) for the Hercules headbadge. I'll send you a photo of a 1965 headbadge so you can get the right one. I haven't taken the photo yet so give me a few days. Im the guy who bought the his and hers Hercules on ebay. 9.99 Ea. I guess im a sucker for the chrome! I need tires and cables and any pointers would be helpful. Im not out to make these perfect as they will get ridden.. alot... dailey drivers so to speak. Beautiful bike! Good for you! Pretty machine. if you are in the 'states then I've heard from other contributors that Wall amrt sometimes have the tyres you need. Matthew - not retired; two tired. Funny you mention walmart. I was just there and they had a spot on the shelf for this size. they are seasonal here in Wi. I guess I will ebay. im thinking Kenda White walls. Or is tan better. If you can get whitewalls, I urge you to go for 'em! That bike would look v-e-r-y sharp with them. >Matthew - not retired; two tired. Try K-Mart for tires. My local one has some. Walmart here used to carry EA-3's but now don't seem have any regular tires of any size. They do have a line of folding tires in boxes. They have a 26x1 3/8 but the box does not say EA-3. One of these days I'll rip one open to see how the tire is marked. I saw some tires in the 26 X 3/8 size that were solid gray or solid white. I was told that they fit wheelchairs and the color wasn't supposed to leave marks on a floor. Perhaps they could be used for a unique look on a roadster. Look closely...wheelchair tires are usually 24 inch tires. And wheelchair tires will be of better quality. Take from a man who knows, wheelchair tyres (tires) are 22" or 24", but the grey tyres sound fun for a bicycle. Have you seen the hideous blue or green tyres available for MTBs? Matthew - rollin, rollin, rollin!